Foreign exchange trading is essentially the trading of the currency from two countries against each other. 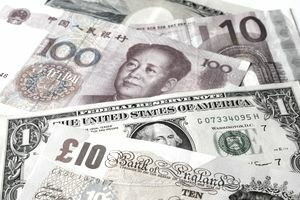 The pairs are predetermined by brokers, who may or may not offer a match for the currency pair that you want to trade. For example, a popular pair that is widely traded is EUR/USD. The EUR/USD is the European Dollar, also known as the EURO, and the USD, which is the US Dollar. When the Euro becomes worth more money in dollars, the pair goes up, and when it is worth less money in dollars, the pair drop in value. If you were to speculate that the USD was going to drop in value compared to the Euro, you would buy the EUR/USD and wait for it to start rising. This is called going long. If you thought the Dollar would gain in value compared to the Euro, you would go short on the EUR/USD pair. All of this trading is done through forex brokers. A forex brokerage is an intermediary that takes on your trade and puts it on the open market. Foreign exchange trading is not done through any centralized market, so all forex broker rates may not be exactly the same at the same time. Forex brokers deal with networks of banks and the trading is carried out electronically within fractions of a second when orders are placed. The whole purpose of trading forex online, for most people, is to make money. Corporations sometimes use it to offset a contract or future purchase that they plan to make. Retail traders trade in the forex markets to make money on changes in the values of currencies over time. One thing that really adds to the fun is that forex brokers offer forex leverage to help you in your trading. Trading with leverage is basically the forex broker allowing you to trade more on the market than what you actually have in your account. This is an advantage for them because they collect fees based on the size of the trades that you make. The larger the trade, the larger the fee. Every time you make a trade with a forex broker they collect what they call the spread, which is a tiny piece of your trade. Trading with leverage seems like it would be a really great advantage, and it can be, but it can hurt you just as much as it can help you. Many new traders start out using as much leverage as possible and that typically leads to quick losses and an account blow up. This is a good reason for new traders to take the time learning to trade forex and start out using as little leverage as possible when trading. When it comes down to it, trading is simple. You look for currencies that will appreciate versus other currencies. Wait for a good time to buy, and then be patient. This simple forex trading system can make you into a forex winner with ease, but it's harder to achieve than you might think. Most people jump into forex trading with the expectation that it's an easy way to get rich. This causes them to make mistakes because of their expectations and fail. Once they've failed, you'll hear various excuses such as, 'the market is rigged and fraudulent.' The truth is that stocks and other markets are traded in very similar ways, the difference is the effect of using leverage. Forex trading is a good way to make money, but it's just like other forms of investment. It takes some education and patience. If you keep your head together, you can make some money.